New Whitby Town recruit Curtis Round says he is looking forward to the challenge of making the step-up to the Evo-Stik Premier Division. The winger joined the club from Northern League Division One outfit Guisborough Town last week, alongside Ste Snaith and Danny McWilliams. All three players have signed for the club on two-year contracts, something that has become a trend under boss Chris Hardy as he looks to build a squad for the future. And Round - one of Whitby’s five summer signings so far - is looking forward to getting back to playing, albeit two divisions higher than the level he was plying his trade at last season. 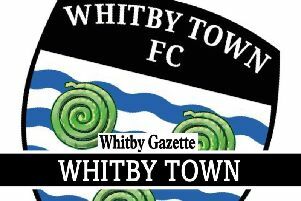 “I really enjoyed my first training session with the club,” he told the Whitby Gazette. “I’ve missed playing since I stopped. I’m eager to get started again. “I noticed an increase in tempo straight away. When I spoke to Chris [Hardy] on the day he first rang me, he said from what I’ve seen he thinks I’ll be able to manage the step up so it’s a fantastic chance to step up and prove that. “Stepping up in the game is tough but again it comes down to Chris. He’s my best chance of doing it. I’m still fairly young and I think that it’s important that I do it with a manager who knows me. The attacking midfielder, who operates using his pace on the left-hand side, was known at Guisborough for his link-up play with full-back Dan McWilliams, something which he hopes to continue when the pair pull on Whitby shirts. “Dan likes to be on the ball and he’s comfortable with it,” Round added. “He plays behind me so we have a good understanding and relationship; we play really well together. The first chance to see Round in action for the Blues, alongside the rest of Town’s new signings, will come on Saturday, when South Shields visit the Turnbull Ground for the first pre-season game of the 2016/17 campaign. Admission will be charged at £6 for adults, £3 for concessions and £1 for under-18s. Under-16s are still admitted free with a paying adult.